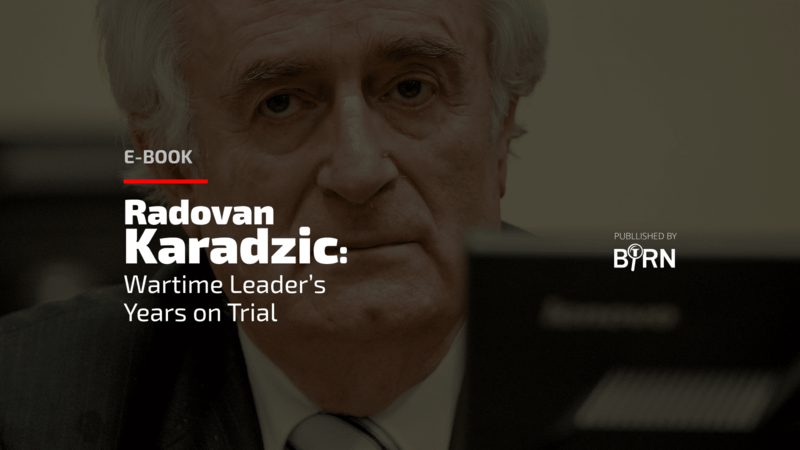 BIRN published a new e-book on Tuesday entitled ‘Radovan Karadzic: Wartime Leader’s Years on Trial’, ahead of the former Bosnian Serb wartime president’s final trial verdict on March 20. The e-book, which is downloadable free of charge, contains all BIRN’s reports on the case, from the period when Karadzic was on the run to when he was caught and extradited, and throughout the whole of the trial that followed. Published in English and in Bosnian/Croatian/Serbian, it includes over 570 articles and runs to more than 1,100 pages. This is the third e-book published by BIRN. The first was an in-depth e-book containing reports and analyses about the Kosovo Specialist Chambers, while the second one was a compilation of reports on Ratko Mladic’s trial. Karadzic’s trial began in 2009, lasted for 499 days and heard 586 witnesses. He was initially indicted by the International Criminal Tribunal for the Former Yugoslavia in 1995. He then spent 12 years on the run, and was finally arrested in Belgrade in 2008 and extradited to the UN tribunal. The first-instance verdict in 2016 found him guilty of the Srebrenica genocide, the persecution and extermination of Croats and Bosniaks from 20 municipalities across Bosnia and Herzegovina, and being a part of a joint criminal enterprise to terrorise the civilian population of Sarajevo during the siege of the city. He was also found guilty of taking UN peacekeepers hostage.